We are excited to relaunch our regular blogs and to reconnect with each one of you with some fun and exciting news, as well as concrete ways in which you can get involved. This is also an opportunity to say “thank you” to all of you who have and continue to partner with us in our mission to raise awareness about human trafficking and activate communities to stand up against this crime. 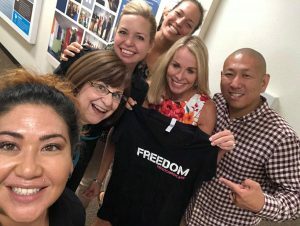 Our first blog of 2019 focuses on a new and exciting initiative, called the Freedom Ambassador Program. Many of you followed us on our Freedom Ride from Bend, Oregon to Newport Beach, California in 2016. This initiative helped launch education in hospitals, schools and the police force. After this initial success, we were encouraged to create our own program to further the mission of the Freedom Ride Project to raise awareness about human trafficking and move people to action in their own communities. Our first partnership meeting with Vanguard University Global Center for Women and Justice, Live2Free and Project Kinship.Left to right: Michelle Asai, Dr. Sandie Morgan, Ruthi Hanchett, Ivana Shepard, Elisabeth Gegner, Steven Kim. 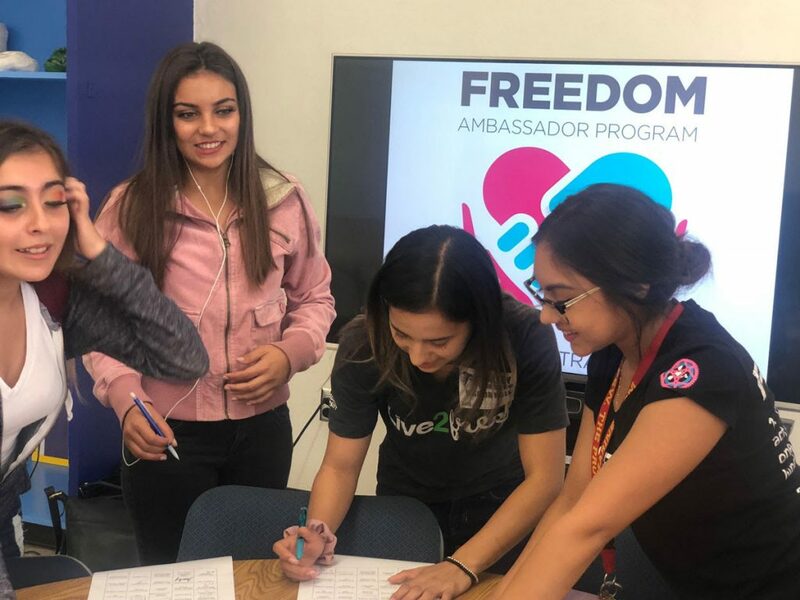 Launched in August 2018, the Freedom Ambassador Program empowers and equips youth in middle and high school to recognize human trafficking and address it through high-impact projects in their own communities. 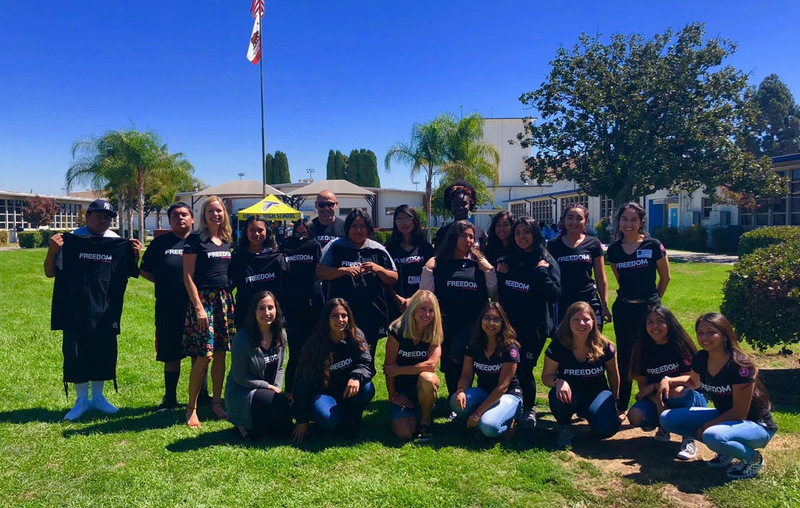 Our program is delivered in partnership with Vanguard University which provides the research, curriculum and peer-to-peer student teaching through their student-led anti-trafficking Live2Free club, as well as with Project Kinship, in the context of its high school leadership programs. Central to the Freedom Ambassador Program is the belief that youth are uniquely and powerfully positioned to help stop this crime, when properly equipped, given their relationship and relatedness with their own peers. Upon completing a 10-week peer-to-peer education program on human trafficking, middle and high school students create their own anti-human trafficking projects to address this crime in their community. Program ideas are pitched before a panel of Shark Tank Judges and adult Mentors, who provide funding and work alongside our students to successfully complete their projects. The success and impact of these projects is being documented in The Freedom Ambassador Film, which will be screened for the first time at Vanguard’s Global Center for Women and Justice Ensure Justice Conference on March 2, 2019, where our Freedom Ambassadors will be celebrated and officially graduate from the program. The Freedom Ambassador Logo: Youth join hands in the middle to protect their friends and community. Hands below are mentors, parents, sponsors and school staff who surround and support our Freedom Ambassadors. The integrated approach of our program is unique in that it goes beyond traditional human trafficking education programs and truly empowers youth to become leaders and transform their communities. It mobilizes not only students, but also parents and staff who are being educated to recognize trafficking and follow a common anti-human trafficking protocol, so that communities and schools lock arms to become trafficking-free. Valley High School Freedom Ambassador conversing with human trafficking survivor, Monique Calderon from Treasures. The program launched September 2018 in Santa Ana. Many of the challenges of this community, including homelessness and poverty, gangs, abuse and involvement in foster care, and the lack of documentation, make people particularly vulnerable to trafficking. The Principal is fully supportive of and actively engaged in the Freedom Ambassador Program and a long time advocate for at risk kids, having played a role himself among the integral community effort between students and educators to free five girls from human trafficking during a longtime career. Within the first few weeks of school, three of our Ambassadors confided that they have friends who have or are currently being trafficked. Our students have launched five different projects that powerfully address human trafficking in their community. One project, by Esmeralda and Brianna, who want to help their trafficked friend, is a video called The Untold Truth, which depicts the life of an ordinary schoolgirl who is lured into trafficking by an older boyfriend. The girls plan to spread the video on social media, introduce it to other schools and have already been invited to talk on a local television show. Other projects include an Anti-Trafficking Mural in Santa Ana created by five boys in collaboration with a professional artist, to educate the community on human trafficking, how stop it and get help. In the Mirror Empowerment project, Eileen and Cindy are creating a purse-sized mirror that says “you are beautiful”, explains how predators prey on kids that have low self-esteem, and educates kids on how to protect themselves. Valley High School Untold Truth Project Team works alongside Live2Free Coaches, Ariane and Ana. New Revolution Film Crew: creators of the Freedom Ambassador Video. Left to right: Dwight and Gina Thompson, Paul Crouch, along with Elisabeth Gegner and Lance Knaack. Our vision is to roll this program out nationally and empower youth across the United States to end human trafficking in their communities. The program is scalable and replicable through a train-the-trainer approach and downloadable, vetted, and regularly updated curriculum from Vanguard University. Our Freedom Ambassador Film will be used to promote the program and inspire other schools and kids to start similar programs. The film traces the journey of our students, who either knew very little about human trafficking or felt powerless to help their trafficked friends, to becoming powerful Freedom Ambassadors actively fighting this crime. While we currently have a great group of volunteers, promoters, donors and sponsors, we are actively looking for support in all these areas, and particularly for volunteers at our upcoming Freedom Ambassador Celebration at Vanguard University’s Global Center for Women and Justice Ensure Justice Conference on March 2, 2019.